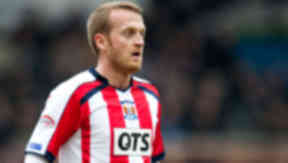 The Northern Irish midfielder is out for four to six weeks after being forced off in the friendly against Carlisle. Kilmarnock midfielder Sammy Clingan will miss the start of the Scottish Premiership season after being ruled out for four to six weeks with a knee injury. The Northern Irishman was forced off during the first half of the 2-2 draw with Carlisle United on Friday night. Scans on the injury have revealed a medial ligament strain, ruling him out of the Ayrshire club's opening fixtures. Speaking after the game, Killie boss Allan Johnston expressed his hope that the player wouldn't face long on the sidelines. “Sammy has got a sore one so we will need to see how it settles down in the morning. He’s got his leg in a brace just now as a precaution,” Johnston said. Posting on his Twitter account, Clingan said: "Just got my results back. Grade 1 medial ligament strain ! Cud hav been worse. Timescale looks like it cud be between 4-6 weeks out."